Stream oil heater unit is designed to heat the oil before it is processed in the reactor. 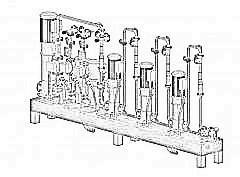 The heater consists of three paired vessels connected consecutively, mounted on a welded frame, a centrifugal pump, automation system and piping. Each vessel contains heater block of 6 tubular electric heaters. The oil is fed by the centrifugal pump via the mesh filter to the vessels where it is heated to the required temperature, controlled by a temperature sensor located at the output of the heater. The automation system turns the heaters on when temperature falls below lower threshold and off when the temperature exceeds the upper limit. Liquid pressure is controlled by pressure gauges at the input and output of the heater. A relief valve is installed to protect the heater from overpressure. The intrinsically safe biodiesel reactor is designed for production of crude biodiesel by mixing of the components of biodiesel production. Our company produces biodiesel reactors from 116 m3/hour to 16m3/hour. All components, piping and valves of the biodiesel reactor system which come in contact with the product, are made of corrosion resistant materials. The design of the reactor allows for control and regulation of the streams during mixing to adjust the process for various types of oil. 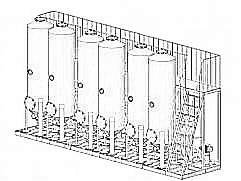 The biodiesel reactor consists of primary and several complementary mixing sections mounted on a welded frame. Prepared components are directed to the hydrodynamic mixer by the pumps. Flow rate is controlled by flowmeters. Regulating valves are installed to adjust the streams. For control of the mixing process, temperature, pressure and flow rates, the reactor equipped with pressure gauges, temperature sensors and vacuum meters. Some kinds of oil may require additional mixing, which is facilitated by complementary mixing section, consisting of a pump, a mixer and control sensors. These sections may be included in the process or disconnected from it as required. The biodiesel settling section with intrinsically safe output section is designed for gravity separation of glycerin and water from crude biodiesel and further discharge of the separated materials for further processing. 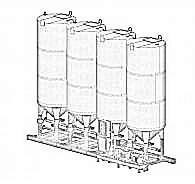 The biodiesel settling section consists of four tanks mounted on a welded frame, assembled separately. Crude biodiesel input line is connected to the input port of the section and biodiesel and glycerin output lines are connected to the section? ?™s output port. Pneumatic valves controlled from the central control panel are installed to control the process. Crude biodiesel goes into the corresponding tank and settles there for a period of time. Phase level sensors are installed in the tanks for control of the separation, and sight glasses also allow visual control. In the process of settling a layer of glycerin and water forms in the bottom of the tank, with biodiesel on top. Glycerin is discharged first, followed by biodiesel. 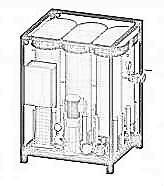 The output section is mounted in a separate frame and includes centrifugal pump for biodiesel output and its flow to the methanol recovery section and a bitumen pump for discharge of glycerin to a separate tank. All components, tanks, pipes and valves of the settling section which come in contact with biodiesel are made of corrosion-resistant materials. The intrinsically safe Biodiesel filtration and purification section is designed for purification of biodiesel from solid particles and residual methanol. The biodiesel purification and filtration section consists of tanks containing ion-exchange resin, filters, forced discharge pump and piping system. A gangway is installed for ease of maintenance and servicing. Biodiesel from methanol recovery section enters the purification and filtration section. Biodiesel flows into the columns via flowmeters. Upward or downward flow is adjusted by valves. Residual methanol is removed on contact with ion-exchange resin. After that the biodiesel is purified of solid particles as it passes through filters. To facilitate forced discharge of the fuel from the tanks, a centrifugal pump is installed in the section. The pump is controlled by magnetic starter. Biodiesel feed is controlled manually by the operator. After purification the biodiesel is ready for consumption. All components and assemblies of the system in contact with biodiesel are made of corrosion-resistant material. Intrinsically safe vacuum methanol recovery section is designed for removal of unreacted methanol from biodiesel. Biodiesel enters the methanol recovery section from settling section. A pump pushes the biodiesel through a heat exchanger to vacuum vessel, where biodiesel is heated and undergoes deep vacuum purification. 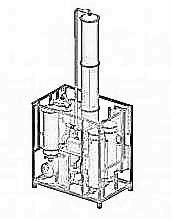 Output pump of the methanol recovery section directs biodiesel to heat exchanger for cooling and then to the filtration and purification section. Temperature is automatically maintained in the required range and is controlled by a temperature sensor. Level of biodiesel in the vacuum vessel is maintained automatically by level sensors. Foaming in the vessel is controlled by foaming sensor. If excessive foam formation is detected, a valve opens to let air into the vessel to decrease the vacuum. After foam levels decrease, the valve closes. Methanol vapor goes to heat exchanger, where it is condensed. Liquid methanol goes to methanol collector. On high level sensor signal, output pump is engaged and methanol input valve is closed. On low level sensor signal the system reverts to its original state. Biodiesel and methanol level can be controlled visually by the operator through sight glasses. Chilled water is used in the section as cooling medium. If necessary, a water solution of antifreeze can be used. Two vacuum pumps are installed in the section to provide the required vacuum pressure. A receiver is fitted in the system to smooth out the vacuum system operation. After methanol recovery section, biodiesel goes to purification and filtration section. All equipment is mounted in a welded frame with base tray. Main components are made of corrosion-resistant materials.